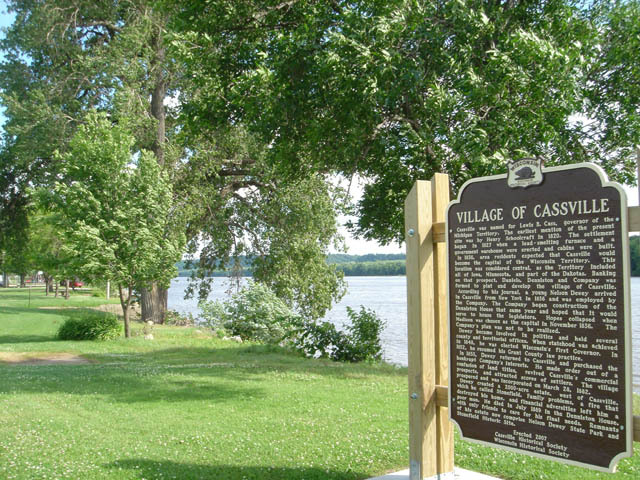 Located Prime Street next to Mississippi river Cassville,WI Coordinates Lat N 45:42':715" Lon W -90:59':359"
Cassville was named for Lewis B. Cass. governor of the Michigan Territory. The earliest mention of the present site was by Henry Schoolcraft in 1820. The settlement began in 1827 when a lead- smelting furnace and a government warehouse were erected and cabins were built. 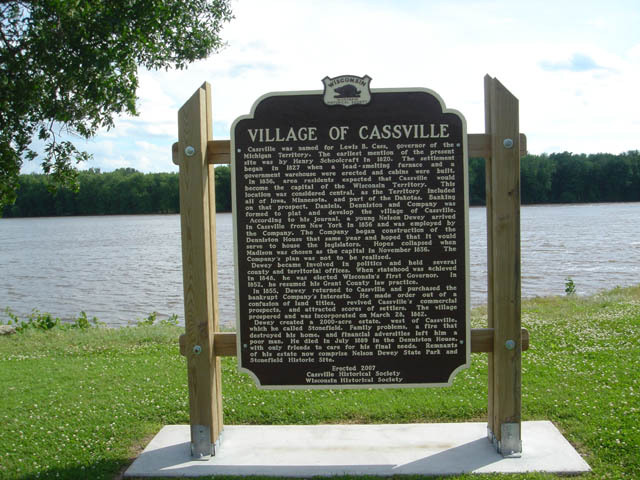 In 1836. area residents expected that Cassville would become the capital of the Wisconsin Territory. This location was considered central, as the Territory included all of Iowa. Minnesota. and part of the Dakotas. Banking on that prospect. Daniels, Denniston and Company was formed to plat and develop the village of Cassville. According to his Journal, a young Nelson Dewey arrived in Cassville from New York in 1836 and was employed by the Company. The Company began construction of the Denniston House that same year and hoped that It would serve to house the legislators. Hopes collapsed when Madison was chosen as the capital in November 1836. The Company's plan was not to be realized. Dewey became involved in politics and held several county and territorial offices. When statehood was achieved in 1848. he was elected Wisconsin's first Governor. In 1852. he resumed his Grant County law practice. In 1855, Dewey returned to Cassville and purchased the bankrupt Company's interests. He made order out of a confusion of land titles, revived Cassville's commercial prospects, and attracted scores of settlers. The village prospered and was Incorporated on March 28, 1882. Dewey created a 2000-acre estate, west of Cassville. which he called Stonefield. Family problems, a fire that destroyed his home. and financial adversities left him a poor man. He died In July 1889 in the Denniston House. , with only friends to care for his final needs. Remnants of his estate now comprise Nelson Dewey State Park and Stonefield Historic Site.